NemaStudio provides the professional developer of NMEA products with a very powerful development and testing tool by simulating the output of various nautical instruments and target objects including GPS, AIS and Radar. All instruments, targets and ports can be matched and mixed, meaning you can have multiple instances of several objects transmitting over the same or over different ports simultaneously. This makes this navigation sensors simulation software program also very suitable for e.g. ECDIS training and simulations. The core function of the program is to send valid NMEA 0183 sentences out via user configurable PC serial communications ports and/or Ethernet UDP connections. Both UDP Multicast and Monocast are supported. The data can be picked up and processed by various navigation equipment supporting the NMEA/IEC61162 protocol. This allows very comfortable testing of your NMEA products in your own environment so that the need for field testing will decrease dramatically. Virtual instruments with configurable dynamic settings give you full control over your test parameters. NemaStudio will also save you a lot of money because you don't need to purchase 'real' NMEA/IEC61162 devices anymore to test your NMEA 0183/IEC61162 compatible products. Currently the program can simulate the output of up to 6 different nautical instruments/sensors and 5 different AIS targets simultaneously, plus an option to produce custom formatted sentences. - Aids to Navigation (message 21). Instruments, sensors, targets and ports can be matched and mixed, meaning you can have multiple instances of several objects transmitting over the same or over different ports simultaneously. The graphical user interface (GUI) is very flexible, with resizable panels that can be hidden and repositioned at will. NemaStudio includes an embedded text editor for easy editing NMEA data without the need to leave the program when text editing is required. 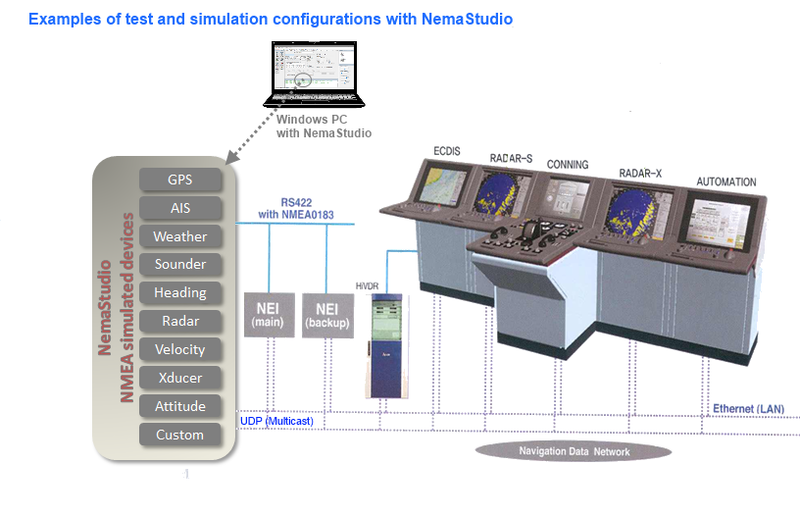 NemaStudio supports both NMEA 0183 version 2.20 and 2.30/3.01/4.0 and IEC 61162. NMEA 2000 networks can be physically connected via a suitable gateway (e.g. the NGW-1 from Actisense). This gateway will also translate the NemaStudio generated NMEA 0183 sentences to valid NMEA 2000 PGN's. Check out the user guide as pdf file or the user guide in html format for all details on NemaStudio. To obtain a license to lift the 500-sentence limitation of the trial version, click the button below.